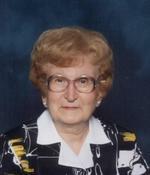 Frances E. Rodi, 90, of Clearfield died Saturday, March 23, 2013 at the Clearfield Hospital. She was born May 26, 1922, a daughter of the late Domenic and Tressa (Unch) Rodi. Ms. Rodi retired in 1988 from Soult Lumber Company after 43 years of employment. She was a member of the St. Francis Catholic Church, Clearfield, where she was also a member of the Rosary and Altar Society. She was also a former member of the Catholic Daughters of America, Clearfield. She is survived by two sisters, Mary Spinella of San Diego, CA and Palma Smith of Ambridge; two brothers, Jack and Sam Rodi, both of Clearfield; and numerous nieces and nephews. In addition to her parents, she was preceded in death by her sister, Victoria Shuck and her brother, Eugene Rodi. A Mass of Christian Burial will be said at 10 a.m. Wednesday at the St. Francis Catholic Church, Clearfield, with Msgr. H. Desmond McGee, Jr. as celebrant. Burial will follow in the Calvary Cemetery, Clearfield. Friends will be received from 6 p.m. – 8 p.m. Tuesday and from 9 a.m. – 9:30 a.m. Wednesday at the Kevin A. Beardsley Funeral Home, Clearfield. At the funeral home Tuesday, a Christian Vigil Service will be held at 7:30 p.m. and the Rosary will be recited at 7:45 p.m. In lieu of flowers, the family suggests that memorial contributions be made to St. Francis Educational Endowment Fund, 212 S. Front St., Clearfield. Obituary Notice: William J. Cromshaw Sr.
Obituary Notice: Harvey F. Murray Jr.